We recently completed a job for Rickers Convenience Stores that required all hands on deck! This large order of posters, corrugated plastic signs and much more is one of many recent jobs we have completed for Rickers through a great new contact, Three Sixty Group. Look at your local Rickers Convenience Store to see the great work from the Stan’s crew! How to use viagra here much more important question in our situation to which you won’t envy and it is discussed even on streets.. The Stan’s wrap crew occasionally has the opportunity to wrap surfaces other than the many vehicles in our back garage. 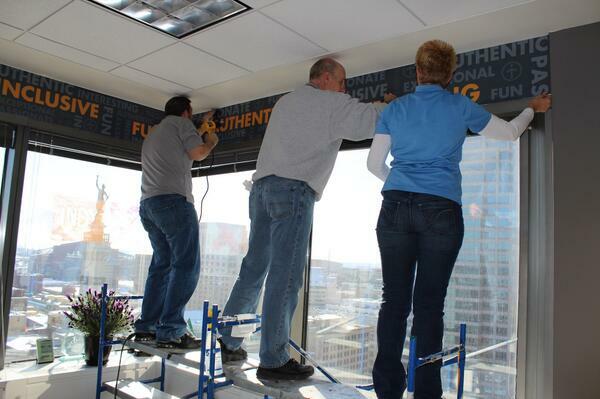 For this project we were able to work with TechPoint to wrap the walls inside one of their offices. Now there is a great wrapped design to look at on the walls in addition to the great view of Monument Circle! 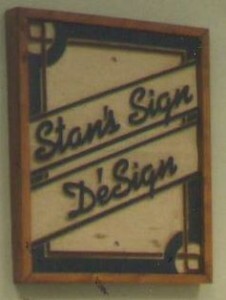 Stan’s Sign Design has been celebrating our 30 year anniversary all week. 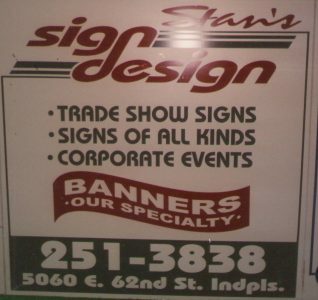 As you can see our logo and signs have changed through the years and even our “specialty” has changed. 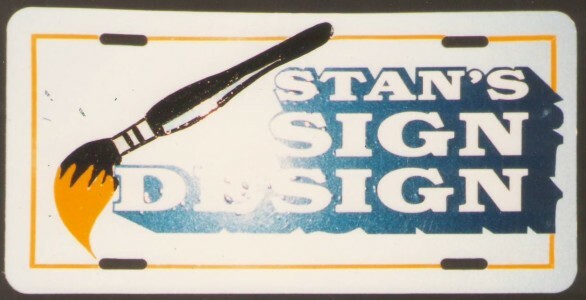 We started out as a hand-painting sign company until we finally bought our first vinyl lettering plotter. Our specialty soon became banners. As technology changed so did we. 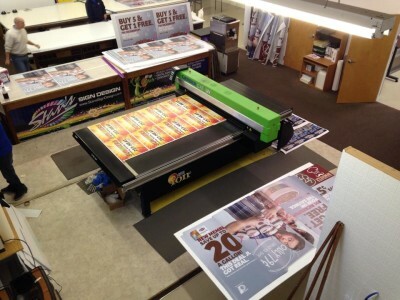 We have bought large format printers and a flat bed printer over the years to make higher quality prints. Our specialty today might be vehicle wraps but we still do banners, trade show signs and corporate events – just no hand painting anymore. Our location has changed a few times over the years too. We started out in Stan & Carolyn’s basement, to an upstairs office above Faerber’s Bee Window, to rented spaces in strip malls and finally to our current location – our own construction building. We are always trying to update our technology and find the latest equipment for making higher quality signs and prints and do it faster and less expensively. One thing that has never changed is that we are a family owned business and we still take pride in providing the best product and customer service. We want to thank all our customers. We know there are many sign companies you could have chosen and we appreciate entrusting us to do the very best for you and your company. 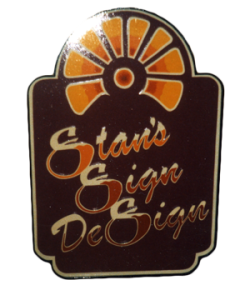 Did you know that Stan’s Sign Design has a sister company that shoots Aerial Photography/Videography with Drones? Here is a video they produced about a BMW 650i Convertible that we wrapped in Matte Black to change the original color from White. 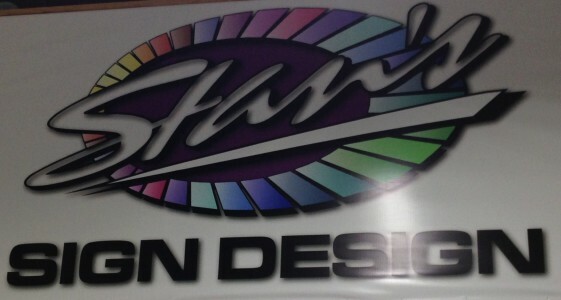 We use only the highest quality vinyl wrap films by Avery & have a wide variety of colors available. Contact Us to wrap your ride!